Ever since the success of Halloween, mascots of just about every holiday have tried to win over the horror crowd, with mixed results. But the flick Uncle Sam scores a perfect win for the 4th of July. This is tight slasher made in 1996 but with the spirit of…well…1776 and 1986! Like all good slashers of the 80s, it takes place in a limited location. In this case, it’s the small town of Twin Rivers. The body of a Desert Storm soldier named Sam is found and sent back to his family. Sam’s young nephew thinks of him as a hero—and so he kind of unlocks the sealed coffin…. There’s no particular explanation for why Sam rises from the grave (or the coffin in this case), but he has a motive; he wants to kill anyone who’s not patriotic and doesn’t love killing people in war. And the list is long. There’s a teacher who dodged the Vietnam War. A tax dodger. A scummy Congressman. Kids who burn an American flag. A kid who fucks up The Star-Spangled Banner on purpose. A kid on stilts and wearing an Uncle Sam costume who peeps on naked chicks in their second floor bedrooms. 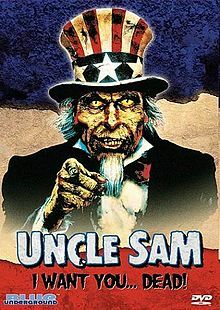 That also happens to be where Sam, who’s basically a zombie (a pretty cool one, at that) gets his creepy Uncle Sam costume. And then he terrorizes the big Independence Day parade. It’s up to Sam’s nephew, veteran Isaac Hayes, and a kid in a wheelchair—who seems to have some sort of psychic connection to Sam—to take him down. Uncle Sam is total slasher fun. Most notable is the fact that other than the few main characters, all other characters are basically tossed on screen just so they can die a few minutes later. Which is fine, because the kills are a hoot. Not overly graphic, they offer just enough blood to bring back that old school slasher spirit. And so does P.J. Soles, who has a small role in the film. Yippee! And in celebration of Independence Day, there are a couple of deaths by flag…and even a final explosion of fireworks with an old-fashioned cannon! 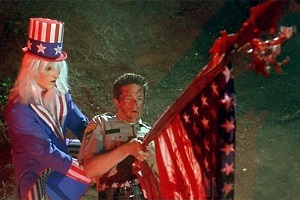 If you horror hounds want a slasher to watch annually, Uncle Sam delivers the red, white, and blood! 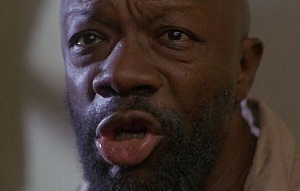 And finally, it’s pretty impossible to bring up Isaac Hayes without bringing up his Chocolate Salty Balls…. 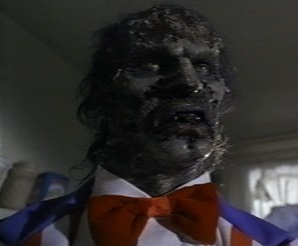 This entry was posted in The Evil of the Thriller - Everything Horror and tagged slashers, Uncle Sam. Bookmark the permalink.